Geo-social discovery apps were the “it” category at SXSW in March but for the most part they’ve fizzled, failing to catch on with mainstream consumers. But Banjo has been one of the lone exceptions, hitting 1 million downloads last month after launching last July, putting it on a faster initial adoption pace than Facebook (s fb), Twitter or Foursquare. The company, which helps people find friends and others nearby, has a new update and downloads are up to 1.5 million across iOS (s aapl), Android (s goog)and the web. According to App Data, Banjo has more than 500,000 monthly active users, well ahead of competitors such as Highlight with just 80,000 MAUs and Sonar with 10,000 MAUs. Glanceee, another competitor that got bought by Facebook, has 30,000 MAUs. Banjo is consistently in the top 100 of social networking apps on iOS and continues to garner solid reviews from users. I recently sat down with Damien Patton, the founder of Banjo, to find out how his company has succeeded while others have stumbled. He said Banjo has caught on with users because it first allows users to see other people they follow or are friends with on a variety of social platforms, not just users of Facebook but also Twitter, Foursquare, LinkedIn (s lnkd), Instagram, Vimeo and Google. Users can get alerts when their friends are nearby. Banjo allows users to view other people around them based on their public check-ins, tweets and activities. That has made the app useful right from the start, instead of plopping someone into a lonely first-time experience. And users don’t have to give away their location just to see what’s going on around them. Patton said Banjo has also tried to strike the right balance on privacy by using the data in a way that is consistent with what people have allowed in their own privacy settings. So only updates with publicly broadcasted location are displayed on Banjo’s map and services such as Facebook only show direct friendships if that’s all a user has allowed. He said the service doesn’t filter by male and female or home and away. Banjo gives people a way to understand the world around them as if they were viewing a location-based browser, said Patton. And it allows people to drill down further by searching for keywords, so people can find other users nearby who have similar interests. One of the cooler tricks for Banjo is the ability for users to not just see what’s around them but zoom into another place and view what people are saying there. That’s another reason why people have found utility in the app beyond what’s nearby. Patton said that’s key because consumers are still not grasping the value of location-based apps. Banjo has also made some practical decisions to help the service take off. It launched on iOS, Android and the web instead of just starting out on iPhones. And it chose a less battery intensive approach to tracking, updating location when it feels like a person has moved a significant distance instead of persistently following someone. Those were some of the problems of Highlight, which is available only on the iPhone and has been dinged for the strain it put on batteries. The new updates to Banjo are designed to showcase photos and make them easier to share. The feed allows for bigger pictures and there’s a new pop up tool for quickly sharing photos to different social networks. There’s also a list view to check out what’s going on nearby. Patton said the app is still a work in progress and some of the upcoming improvements are aimed at giving people even more privacy controls. He said he’s working on giving new users the ability to see how other users are viewing them. That can alert them to whether or not they want to adjust their privacy settings on Banjo or their social networks. He’s also looking at giving people more control over what notifications users get, so they can filter out more noise but potentially get alerts on more events and people that matter to them. 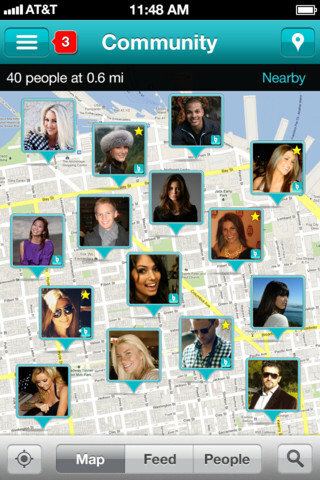 I think Banjo and other geo-social apps that show you people around you are still pushing the envelope for many users. A lot of people may not be aware how much information they’re publicly broadcasting. And many aren’t aware of some of these services that organize and display this data in such a visual and location-centric way. That may prompt some people to rethink how much they want to share through various social networks. People have been largely skeptical of check-in services. But increasingly we are seeing users getting more comfortable with sharing all kinds of information and broadcasting their location through networks like Foursquare. Services like Banjo, when done well, can explain some of the power of location and provide the kind of utility that makes location-based services useful. But it will take a constant attention to privacy to ensure that people still feel in control with how much they’re sharing. Is it feasible for a business to utilize Banjo to locate potential guests via a social search on Banjo? If I personally and following someone on twitter or another platform does that person’s information pop up as result of me utilizing Banjo? Banjo is a terrific app that I use at home and while traveling to connect with friends and associates in my social networks who just happen to be where I am. That’s been very cool. Plus it’s fun to use. Damien is speaking at UNTETHER.talks in Toronto on June 26! Come hear from some of the brightest minds in Mobile.